Particle & Surface Sciences has released the new HPVA-100 High-Pressure Volumetric Analyzer; designed to measure high-pressure adsorption isotherms with hydrogen, methane, carbon dioxide and other gases using the static volumetric method. Typical applications for this instrument include catalysts, zeolites, activated carbons, carbon nanotubes and hydrides. Having a reliable analysis of material adsorption characteristics is critical in the research and advancement of hydrogen storage, fuel cells and batteries, stack gas scrubbers, and hydrocarbon traps. The HPVA product operating pressure ranges from high vacuum to 200 bar. Sample temperature is from cryogenic to 500 °C and sample analysis data collection is automated for quality data and high reproducibility. 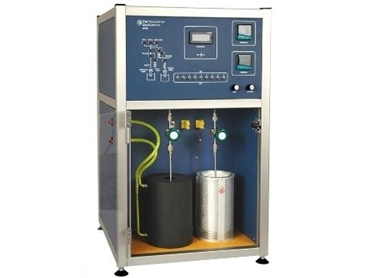 Thr HPVA is available in both a single-station model or a four-station version that allows up to four sample runs to be completed simultaneously. Pressure Ranges from ultra-high vacuum to 200 bars. Handles typical adsorbates such as Nitrogen, Hydrogen, Methane, Argon, Oxygen, Carbon Monoxide, and Carbon Dioxide. Comprehensive Data Analysis Package using Microsoft Excel® macros for data processing and graphing. Software includes NIST RefProp Database 23.